Getting computers to do what you want them to can be a tricky task, but an unobtrusive 'digital tattoo' developed by a team of engineers promises to let them read your mind instead. Existing brain-scanning equipment, known as Electroencephalography or EEG for short, is large and bulky - so John Rogers from the University of Illinois set out to build something better. His team has created an EEG system that sticks to the skin behind your ear and discretely monitors your brain activity. The device, which is so light that it can stick to the skin without adhesive, can be worn continuously for up to two weeks - until the build-up of dead skin cells underneath makes it drop off. 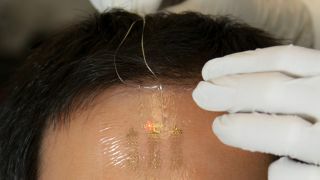 It comprises of a patch of gold electrodes, which read electrical signals from the brain. While it's not precise or fast enough to replace our traditional computer input tools yet, volunteers were able to spell the word "computer" out on a screen using nothing but their brain's electrical activity during testing. Medicine is the first field that the researchers are concentrating on. "EEG is important in detecting seizures – particularly in premature babies," said Rogers in an interview with New Scientist, but he added that many other applications are possible. Especially ones that are more passive than active in nature - like brewing coffee when it detects you're waking up in the morning. Down the line, it's possible that it could be used to tell connected devices what we want without consciously doing so. When your phone detects that you're concentrating, it could automatically silence notifications, for example. The patch still needs a little work - it was wired up to a computer during tests, but the team believes that wireless transmission of power and data shouldn't be too troublesome, and has already achieved it in other similar devices.